Tiles can be different types and range from simple square tiles to complex mosaics. We install tiles often for coverings wall, floor, roofs, and showers, or other objects such as tabletops. When it comes to the tile, there are so many options to choose from that a lot of homeowners even dot not think about. Any store or showroom offer enormous variety of tile that sometimes it is even hard to make fast decision which type, shape, color or size will be the best for the new renovation project. There are different types of tile materials. Ceramic tile made from fired clay. 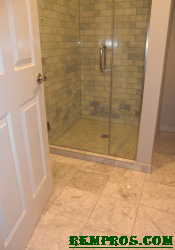 It is one of the most popular tile options and can be installed in any room from basement floor to walls in the shower. Some ceramics are denser than the others and some can be glazed. Porcelain tile also made from clay but it has been fired at much higher temperatures compare to ceramic tiles. Differences from the ceramic tile are as follow: very low water absorption rate (less than 0.5), more dense and harder, less porous and prone to stain and frost resistant. Porcelain tile has a very hard surface which is almost impossible to scratch. It will less likely to chip. Due to high ability to withstand different impacts it can be used for outdoor home design as well. Stone -(granite, limestone, marble, travertine, slate, quartz). Generally natural stone tile will give better look compare to ceramic and porcelain tiles. From the other hand, stone tiles are more porous, have greater water/stain absorption, and have more expensive labor cost. All stone tiles have higher maintenance requirements because sealer should be applied periodically. Glass tile- (clear glass, frosted glass, bubble glass). Glass material is no porous which makes tile be water and stain resistant. It is an excellent choice for bathrooms and kitchen backsplashes. Metal tile made from different metal materials which gives exclusive look. Metal tile can vary from copper to stainless steel, patina to bronze and zinc. These type of tile can be used for backsplashes and even on walls. Tile is a one of the most durable materials and it is possible to install it in any inside area. Some tile such as porcelain, glass or metal will be good for outside projects as well. Cost of tile installation will depend on a type of tile at a first place. Prior to the installation of any type of tile the area should be properly prepared. It is essential that area, where tile will be installed is stable in order to avoid any cracks after installation. If it is plywood or any other wood on the floor, install tile underlayment prior to tile installation. In the bathroom or any other wet areas install waterproof drywall on the walls first and then put tile. In the shower install water and mold resistant cement boards on the walls and ceiling and glue it to the studs. Also, even though, drywall and cement boards will be not visible after tile will be install, always type and patch or glue corners and spaces between boards. When preparation process is done and tile is ready for the installation use proper type of adhesive to set the tile. Usually it takes one day for the tile adhesive to dry. Next step is to grout tile. If spaces between tile are big (¼ of an inch) or more use sanded grout, if less you should use not sanded type of grout. The very last step of installation is to seal any type of stone tile by using a proper sealer.